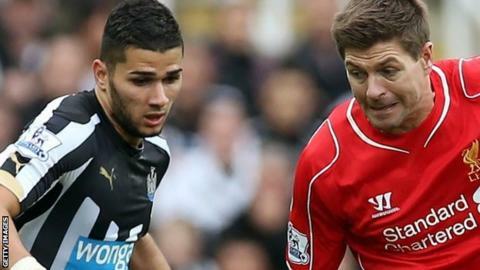 Newcastle United midfielder Mehdi Abeid says he is "still learning" after making his Premier League debut in Saturday's 1-0 win over Liverpool. Abeid, 22, has played just nine times for the Magpies since his 2011 move from Lens and had loans at St Johnstone and Panathinaikos for game time. He has been brought into Alan Pardew's first team this term and made his bow in Saturday's win at St James' Park. "It's not finished, I have to learn every day," Abeid told BBC Newcastle. "I want to play against the big players and judge myself. The last three years I've been patient and I have to stay that way." Three of Abeid's four starts this season have been in the League Cup, helping Newcastle to victories against Gillingham, Crystal Palace and Manchester City. The latter appearance brought the France-born Algeria Under-23 international up against Yaya Toure, Fernandinho and Samir Nasri in the City midfield, while he faced Steven Gerrard and Philippe Coutinho in Saturday's victory against Liverpool. "It's unreal for me to play against big sides like Liverpool and Manchester City in one week," continued Abeid. "It's fantastic getting more experience. I'm learning against big players and now I have to keep my head down. "I want to prove I can do a job for the team and the coach."